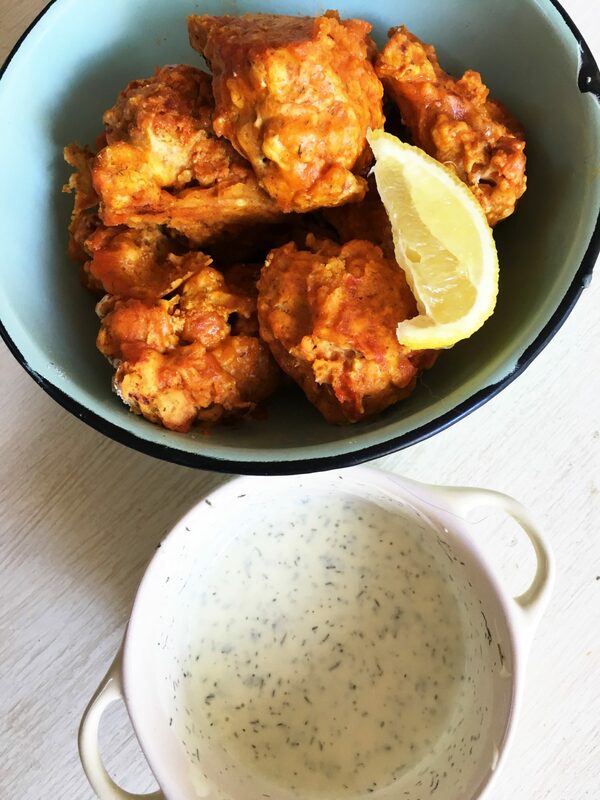 These hot cauliflower wings will satisfy most tastebuds. They seem sinful but works well as a meat substitute or as finger food at a party. Great recipe to make for friends and family. Mix the milk, salt, pepper and hot sauce together. Add the cut cauliflower pieces to the mix and cover. I normally let it marinade overnight. Add parchment paper to a dish and line your cauliflower florets neatly onto the tray. Bake for 40 minutes at 200 degrees Celsius. Turn over after 20 minutes. Mix the cold water and tempura flour together in a bowl. Mix the all-purpose flour together with all the spices in another bowl. Keep the left-over marinade hot sauce in a third bowl. Dip the cauliflower into the wet batter, then the flour, then the hot marinade hot sauce and place on the baking sheet again. Take them out and dip them (while hot) one last time in the hot sauce. Don't leave out this step. This is what gives the wings a lovely dark golden color. For the dill sauce, mix the mayo, milk and dried dill together to make a simple dipping sauce.